Celecoxib is a selective COX-2 inhibitor with IC50 of 40 nM in Sf9 cells. Tumors were resected from mice 10 days after orthotopic inoculation of 4T1-Luc2 cells, and hydrogels loaded with the following payloads were evaluated: anti–PD-1, anti-CTLA-4, IL-15sa, lenalidomide, celecoxib, STING-RR, or R848. Mice that did not receive a hydrogel were examined as a negative control. (A) IVIS imaging of 4T1-Luc2 cells is shown for all groups described and illustrates tumor burden. Science, 2018, 10(433), doi: 10.1126/scitranslmed.aar1916. Celecoxib purchased from Selleck. Reduced hepatic lipid contents and alleviated liver injury in EC-AMPK mice treated with selective COX-2 inhibitors. Wild-type and EC-AMPK mice given a high fat diet were treated with vehicle, celecoxib or nimesulide for a period of 4 weeks. At the end of treatment, parameters including body weight and circulating glucose (A), serum triglyceride and cholesterol levels (B were measured and presented as percentage comparisons against those from vehicle-treated wild-type mice. *P < 0.05 versus wild-type mice treated with vehicle; #P < 0.05 versus EC-AMPK mice treated with vehicle, n = 3-5. Br J Pharmacol 2014 171(2), 498-508. Celecoxib purchased from Selleck. 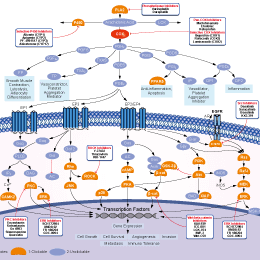 Breast cancer cells, wild type (WT) or anoikis resistant (AR) variants, were treated with celecoxib (CEL 5.0 uM) and/or sildenafil (SIL, 2.0 uM). Cells were isolated after 24h and viability determined by trypan blue exclusion (n = 3, +/- SEM) * p < 0.05 greater than corresponding value in vehicle control. Upper inset pictures: HCC38 cells in 96 well plates were treated with celecoxib (CEL 5.0 uM) and/or sildenafil (SIL, 2.0 uM). Cells were isolated after 24h and viability determined using a live-dead assay (red cells = dead; green cells = alive) (n = 3, +/- SEM) * p < 0.05 greater than corresponding value in vehicle control. J Cell Physiol 2014 10.1002/jcp.24843. Celecoxib purchased from Selleck. J Transl Med, 2017, 15(1):46. Celecoxib purchased from Selleck. Oncol Lett, 2018, 16(1):317-325. Celecoxib purchased from Selleck. Expression of COX protein in insect cells is determined by assessing PG-synthetic capability in homogenates from cells incubated for 3 days with COX-1 or COX-2 baculovirus. Cells expressing COX-1 or COX-2 are homogenized and incubated with arachidonic acid (10 μM). COX activity is determined by monitoring PG production. No COX activity is detected in mock-infected Sf9 cells. Celecoxib are preincubated with crude 1% CHAPS homogenates (2-10 μg of protein) for 10 minutes before addition of arachidonic acid. PGE2 formed is detected by ELISA after 10 minute incubation. Method: The antiproliferative effect of Celecoxib on NPC cells is assessed using an MTT assay. Cells are seeded into 96-well plates and allowed to attach for 24 hours. The cells are then treated with increasing concentrations of Celecoxib (0 to 75 μM) dissolved in DMSO (final concentration ≤0.1%) and incubated for up to 48 hours. After the incubation, 20 μL of MTT dye (5 mg/mL) are added to each well and cells are incubated at 37 °C for 4 hours. After removing the supernatants, the crystals are dissolved in DMSO and the absorbance is measured at 490 nm. The half-maximal inhibitory concentration (IC50) values and the 95% confidence intervals are calculated using probit regression using SPSS 15.0 software. The experiment is performed in triplicate and repeated at least three times. Animal Models: A 0.1 mL aliquot of a 1% solution of carrageenan in 0.9% sterile saline or 1 mg of Mycobacterium butyricum in 50 μL of mineral oil is administered to the right hind foot pad of male Sprague−Dawley rats. Formulation: Celecoxib is dissolved in 0.5% methyl cellulose and 0.025% Tween-20. Penning TD, et al. J Med Chem, 1997, 40(9), 1347-1365. Liu DB, et al. Acta Pharmacol Sin, 2012, 33(5), 682-690. Hunter NR, et al. Int J Radiat Oncol Biol Phys, 2012, doi:10.1016/j.ijrobp.2012.04.025. I am doing an animal experiment with mice and planning to administrate S1261 via oral gavage. what are your recommendations for diluting the compound? For oral administration, Celecoxib can be dissolved in vehicle one: "0.5% methyl cellulose and 0.025% Tween-20", or the vehicle 2 "2% DMSO/30% PEG 300/5% Tween 80/ ddH2O". Naproxen : Pan-COX inhibitor, COX-1, IC50=8.7 μM; COX-2, IC50=5.2 μM. Lornoxicam : COX-1, IC50=5 nM; COX-2, IC50=8 nM. Ibuprofen : Approved by FDA for relieving pain, alleviating fever,and reducing inflammation. Ketorolac : Non-selective COX inhibitor of COX-1 and COX-2 with IC50 of 1.23 μM and 3.50 μM, respectively. Indomethacin is a nonselective COX1 and COX2 inhibitor with IC50 of 0.1 μg/mL and 5 μg/mL, respectively, used to reduce fever, pain, stiffness, and swelling. Lornoxicam is a non-steroidal COX-1/COX-2 inhibitor, used as an anti-inflammatory drug to treat pain, osteoarthritis, and rheumatoid arthritis. Aspirin is a salicylate, and irreversible COX1 and COX2 inhibitor, used as an analgesic to relieve minor aches and pains, as an antipyretic to reduce fever, and as an anti-inflammatory medication. Rofecoxib is a COX-2 inhibitor with IC50 of 18 nM. Ketorolac (Ketorolac tromethamine) is a non-selective COX inhibitor of COX-1 and COX-2 with IC50 of 1.23 μM and 3.50 μM, respectively. Features:A COX-1 preferential inhibitor among currently marked nonsteroidal anti-inflammatory drugs (NSAIDs). Bufexamac is a COX inhibitor for IFN-α release with EC50 of 8.9 μM. Features:A specific inhibitor of class IIB histone deacetylases. Ibuprofen (Dolgesic) is an anti-inflammatory inhibitor targeting COX-1 and COX-2 with IC50 of 13 μM and 370 μM, respectively. Features:Considered a core medicine in the WHO's "WHO Model List of Essential Medicines" (a list of the minimum medical requirements for a basic healthcare system).